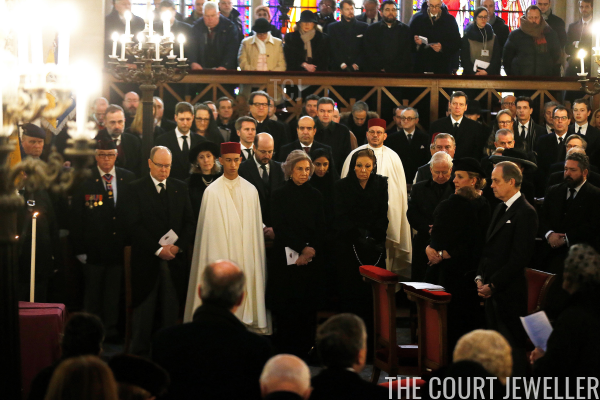 On Saturday, royals and pretenders from around the world gathered in Dreux for the funeral of Henri of Orleans, one of the claimants of the French throne. Henri was the Head of the House of Orleans from 1999 until his death in January. As the senior male-line descendant of the deposed King Louis-Philippe of the French, he was also the Orleanist pretender to the French throne. (There are three prominent French pretenders: the Orleanist claimant, who descends from King Louis-Philippe; the Legitimist claimant, who descends from King Louis XIV; and the Bonapartist claimant, who descends from Napoleon Bonaparte's brother, Jerome.) Former French royals have no legal titles, but the head of the house usually confers various titles on his descendants. The head of the family uses the title "Count of Paris," as Henri did for the last two decades of his life. 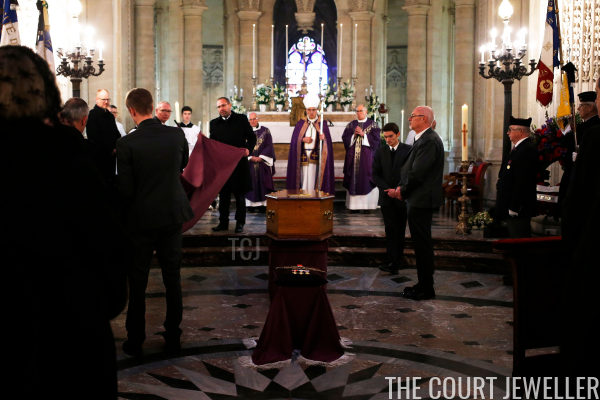 Henri's funeral was held at the Royal Chapel of Dreux, the traditional burial site of members of the House of Orleans. 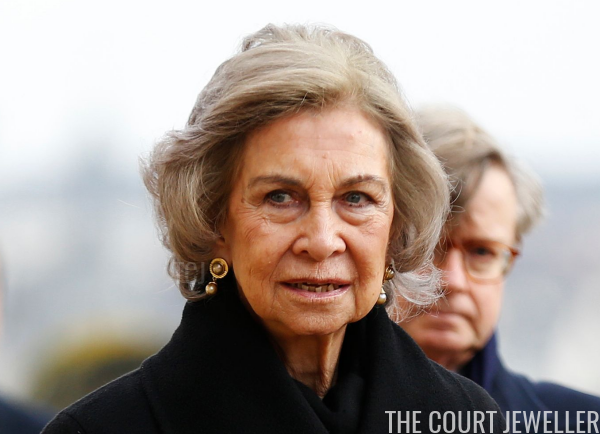 Many members of the family attended the funeral, including Henri's daughter-in-law, Philomena of Orleans, Duchess of Vendome. 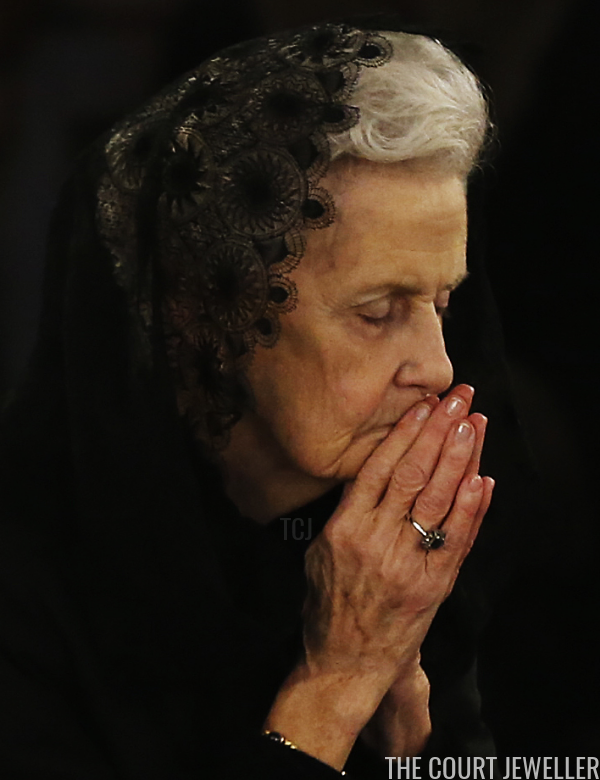 Philomena, who wore simple pearls to her father-in-law's funeral, is married to Henri's second son, Jean. The couple have five children; her younger son, Joseph, is sitting on her lap in the photo above. 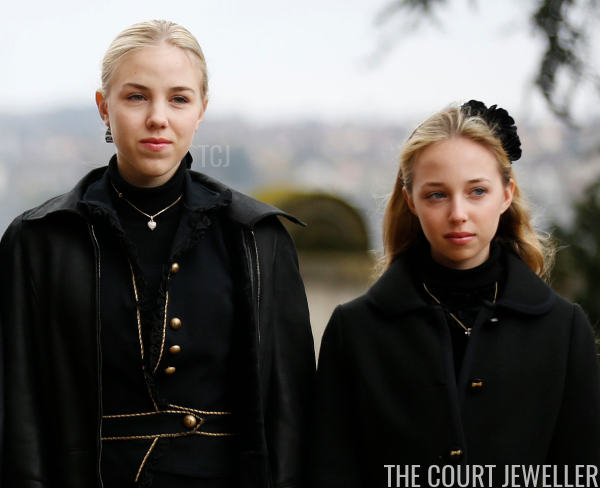 Two of Henri's sisters, Helene of Limburg-Stirum and Chantal de Sambucy de Sorgue, were photographed attending the service. So was his sister, Diane, pictured here with her son, Eberhard of Wurttemberg. Henri's younger brother, Michel of Orleans, Count of Evreux, was photographed with his new wife, Barbara. Another brother, Jacque of Orleans, Duke of Orleans attended as well. 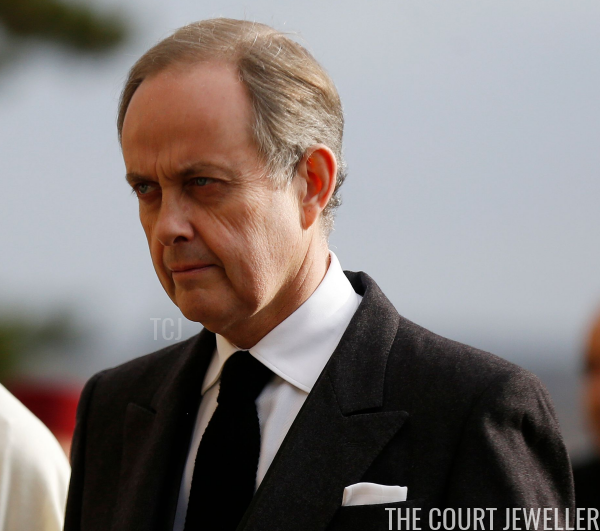 Cameras also captured Henri's former wife, the Duchess of Montpensier, at the funeral. Born Marie Therese of Wurttemberg, she and Henri were married from 1957 until 1984. 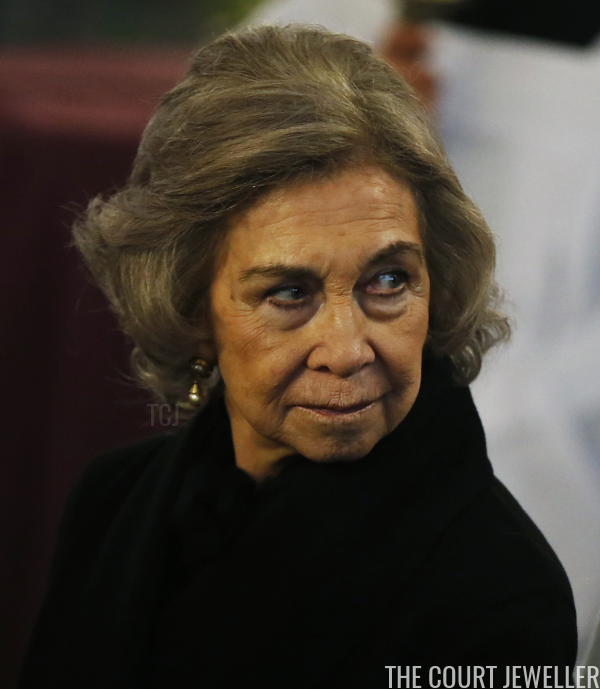 Queen Sofia of Spain represented the Spanish royal family at the funeral. She wore intriguing pearl drop earrings for the service. Here's a better look at the pearls, which have a distinctive gray cast to them. The stud of the earring is set button-style in yellow gold. 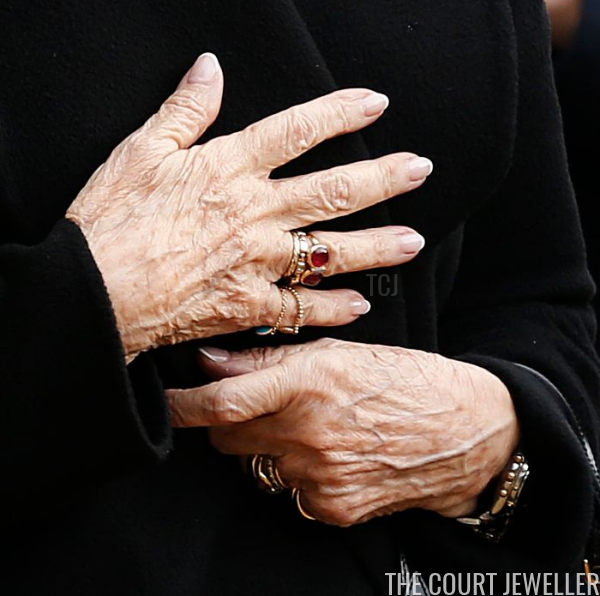 We also got a glimpse of Sofia's stacks of rings, including an interesting ruby and gold ring. 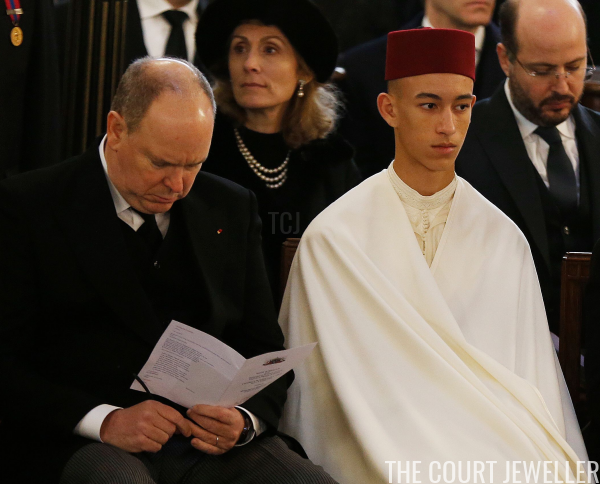 Behind Prince Albert II of Monaco and Crown Prince Moulay Hassan of Morocco you'll spot Princess Sibilla of Luxembourg, wearing pearl drop earrings and a triple-stranded necklace of pearls. Isabelle of Liechtenstein, sister-in-law of Prince Hans-Adam II, attended with her husband, Prince Philipp. 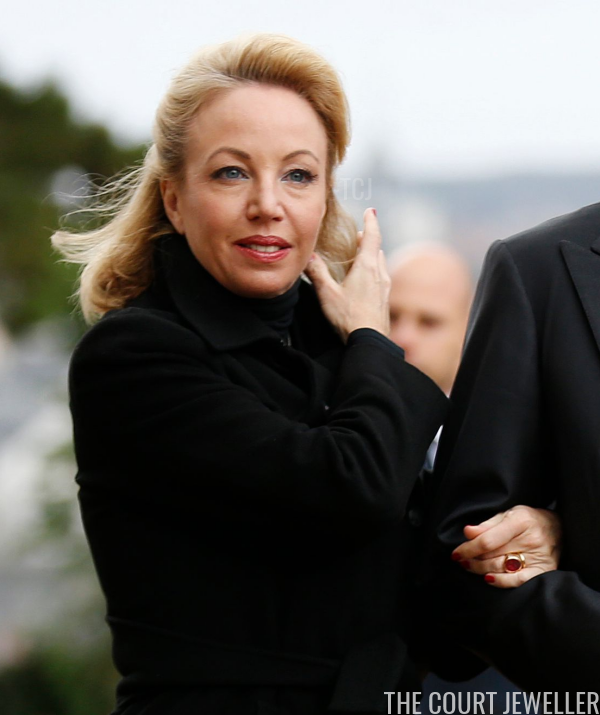 And Lea, wife of the late Prince Alexandre of Belgium, was also present. Numerous pretenders and royals who have lost their thrones were also present, including Leka of Albania, Emanuele Filiberto of Savoy, and George Mikhailovich of Russia. Farah Pahlavi, the former Empress of Iran, also attended; she lives part-time in France. Camilla of Bourbon-Two Sicilies wore almost no jewelry, save for her wedding ring and a signet-style ring. Her daughters, Maria Carolina and Maria Chiara, each wore silver pendant necklaces. 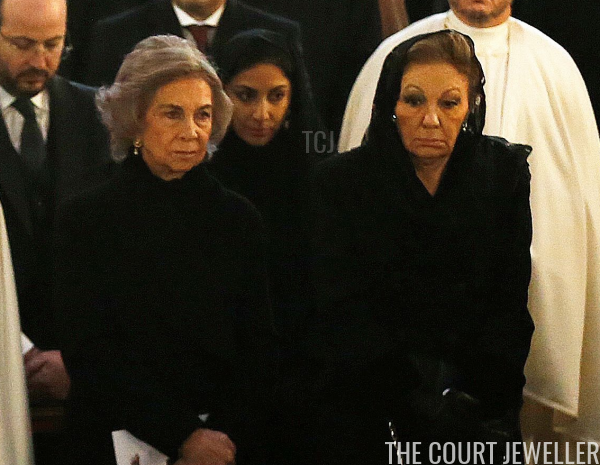 Alvaro of Orleans-Bourbon attended the service with his wife, Antonella, and their daughter, Eulalia. Alvaro is the uncle of the present Duke of Galliera. Following his father's passing, Jean of Orleans is the new head of the House of Orleans and, therefore, the new Orleanist pretender to the French throne. Jean, who has used the title of Duke of Vendome since it was bestowed on him by his grandfather in 1987, succeeds to the title of Count of Paris -- but reports suggest that he has decided not to use it until after a period of mourning for his father has passed. Jean's heir is his son, Gaston, who will turn ten later this year.